24-year-old Michael Fennelly has just been given captaincy of the Kilkenny senior hurling team - a great honour to be given to any young man, but especially when it comes with the strong possibility that he will be lifting the McCarthy Cup next September. He has been playing with his club Ballyhale Shamrocks for a number of years and has been a member of the Kilkenny senior inter-county team since 2006. Michael first came to prominence on the inter-county scene as a member of the Kilkenny minor hurling team in the early 2000s. 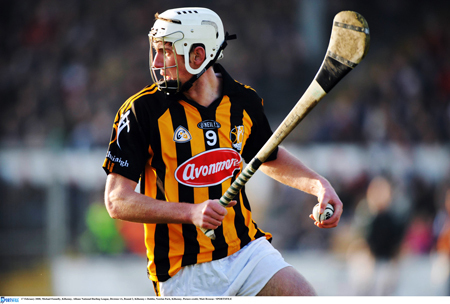 In 2008 Kilkenny launched an all-out attack in an attempt to capture a third All-Ireland title in-a-row, as we know Kilkenny beat Waterford by 3-30 to 1-13 to take a third consecutive All-Ireland title. Will this year be four in a row for the Cats and will Michael Fennelly get to lift the coveted Liam McCarthy Cup like his uncles Liam and Ger did before him? Unfortunately Michael’s first chance of lifting cup glory didn’t materialise, as he was down and out with the mumps for the league final against Tipperary. Speaking to Michael it’s obvious straight way that he is leadership material. A young man who is way wiser than his years, and hailing from a family of hurlers, he is well equipped for the task in hand. Friendly and full of energy it’s hard to believe this he is currently dealing with the mumps when I speak to him. So dedicated was he that he still turned up for the bus on league final day only for the doctor to send him home to rest. "I was feeling really sick and my glands were swollen and cheeks too, but I didn’t want to let the team down," he said. "Of course I had to listen to the doctor and went home and rested. I watched the game on TV at home but it was a killer not being there. Despite that, it was some cracker of a game and I was thrilled we won." Michael’s hurling career started at the tender age of six when he lined out with Ballyhale Shamrocks - with sports big in the family it was a natural thing. Brother Colin is also a player and Michael’s sisters Ciara, Grace, Lorna, Margaret Mary, mother Margaret and dad Michael are staunch GAA supporters. Without the GAA, Michael doesn’t know what he would do with his time. Life is pretty much 100 per cent centred around the sport. "My typical week centres around working in the Kilkenny branch of Ulster Bank," he said. "After that it’s all working out. I train with the Kilkenny team Tuesday, Friday, and Sunday. I normally swim on Monday to unwind after the weekend, and I’ll use the gym on Wednesday." "We don’t really have the typical social life," he said. "There’s no late nights, no drinking and wild parties. We are on the go nine months of the year and even during the off season you’re looking after yourself and working out and not going wild. You have to be careful not to get injured as well and look after yourself. In saying that, you sign up for it and I’ve never felt cheated in any way." He may be young, but Michael has noticed many changes in the game during the past few years. "Nutrition is more structured for players as well," he said. "We have our own health plans devised by a nutritionist, which we stick to and keep ourselves healthy. Michael’s proudest moment, aside from taking on the captaincy, came when Ballyhale won the Club All-Ireland championship. "My father had won it in his time and it was brilliant to be part of it too," he said. "It was my first time winning it with the club." With time on his hands now Michael has been able to give some thought to what he'd change about hurling. "It's not so much about the game, but I would add a fourth official and give the referee an earpiece to communicate with his other officials," he said. "Also I would lower the prices of the tickets into Croke Park. Certain areas of the grounds should be a lot cheaper and generally the ticket price should be lower." As he takes time out to recuperate Michael admits he is missing having a busy schedule. "I miss togging out, playing the game, hanging out with all the lads, and the overall feeling you get from a good game," he said. "The GAA has had such a huge impact on my life. It has given me an outlet for energy and passion, it has given me friends not only from Kilkenny but every county, it has made me the person I am today." A ball and a wall! Page generated in 0.1166 seconds.